African American music began incorporating Afro-Cuban musical motifs in the 19th century, when the habanera (Cuban contradanza) gained international popularity. The habanera was the first written music to be rhythmically based on an African motif. The habanera rhythm (also known as congo, tango-congo, or tango ) can be thought of as a combination of tresillo and the backbeat. Wynton Marsalis considers tresillo to be the New Orleans "clave," although technically, the pattern is only half a clave. "St. Louis Blues" (1914) by W. C. Handy has a habanera-tresillo bass line. Handy noted a reaction to the habanera rhythm included in Will H. Tyler's "Maori": "I observed that there was a sudden, proud and graceful reaction to the rhythm...White dancers, as I had observed them, took the number in stride. I began to suspect that there was something Negroid in that beat." After noting a similar reaction to the same rhythm in "La Paloma", Handy included this rhythm in his "St. Louis Blues", the instrumental copy of "Memphis Blues", the chorus of "Beale Street Blues", and other compositions. Jelly Roll Morton considered the tresillo-habanera (which he called the Spanish tinge) to be an essential ingredient of jazz. The habanera rhythm can be heard in his left hand on songs like "The Crave" (1910, recorded 1938). 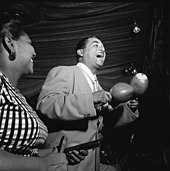 Bauzá introduced bebop innovator Dizzy Gillespie to the Cuban conga drummer Chano Pozo. "Manteca" is the first jazz standard to be rhythmically based on clave. "Manteca" was co-written by Dizzy Gillespie and Chano Pozo in 1947. 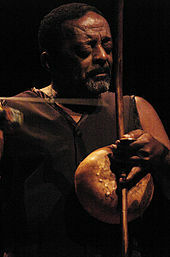 According to Gillespie, Pozo created the layered, contrapuntal guajeos (Afro-Cuban ostinatos) of the A section and the introduction, and Gillespie wrote the bridge. The rhythm of the melody of the A section is identical to a common mambo bell pattern. Top: opening measures of "Manteca" melody. Bottom: common mambo bell pattern (2-3 clave). On March 31, 1946, Stan Kenton recorded "Machito," written by his collaborator / arranger Pete Rugolo, which is considered by some to be the first Latin jazz recording by American jazz musicians. The Kenton band was augmented by Ivan Lopez on bongos and Eugenio Reyes on maracas. Later, on December 6 the same year, Stan Kenton recorded an arrangement of the Afro-Cuban tune "The Peanut Vendor" with members of Machito's rhythm section. Kenny Dorham "Minor's Holiday", "Basheer's Dream", Hank Mobley "Recado Bossa Nova" and Sabu Martinez jazz tune developed Afro-Cuban jazz from 50s to 60s. Bossa nova is a hybrid form based on the samba rhythm, but influenced by European and American music from Debussy to US jazz. Bossa nova originated in the 1950s, largely from the efforts of Brazilians Antonio Carlos Jobim and João Gilberto. Its most famous song is arguably "The Girl from Ipanema" sung by Gilberto and his wife, Astrud Gilberto. While the musical style evolved from samba, it is more complex harmonically and less percussive. Bossa nova emerged primarily from the upscale beachside neighborhoods of Rio de Janeiro as opposed to samba's origins in the favelas of Rio. Certain similar elements were already evident, even influencing Western classical music like Gershwin's Cuban Overture which has the characteristic 'Latin' clave rhythm. The influence on bossa nova of jazz styles such as cool jazz is often debated by historians and fans, but a similar "cool sensibility" is apparent. Bossa nova was developed in Brazil in the mid-1950s, with its creation being credited to artists including Johnny Alf, Antonio Carlos Jobim and João Gilberto. One of the first songs was "Bim-Bom"(Gilberto). Bossa nova was made popular by Dorival Caymmi's "Saudade da Bahia" and Elizete Cardoso's recording of "Chega de Saudade" on the Canção do Amor Demais LP, composed by Vinícius de Moraes (lyrics) and Antonio Carlos Jobim (music). The song was soon after released by Gilberto. Bossa nova snare rim pattern ( Play (help·info)). ^ Acosta, Leonardo (2003: 5). Cubano Be Cubano Bop; One Hundred Years of Jazz in Cuba. Washington D.C.: Smithsonian Books. ^ Mauleón (1999: 4) Salsa Guidebook for Piano and Ensemble. Petaluma, California: Sher Music. ISBN 0-9614701-9-4. ^ "Wynton Marsalis part 2." 60 Minutes. CBS News (26 June 2011). ^ Orovio, Helio. 1981. Diccionario de la Música Cubana, p. 237. La Habana, Editorial Letras Cubanas. ISBN 959-10-0048-0. ^ Morton, “Jelly Roll” (1938: Library of Congress Recording) The Complete Recordings By Alan Lomax. ^ Schuller, Gunther (1968: 19) Early Jazz; Its Roots and Musical Development. New York: Oxford Press. ^ Peñalosa, David 2010. The Clave Matrix; Afro-Cuban Rhythm: Its Principles and African Origins p. 256. Redway, CA: Bembe Inc. ISBN 1-886502-80-3. ^ Salazar, Max (1997). "The Beginning and Its Best" Latin Beat Magazine v.7 n. 1. ^ Notes from The Mambo Inn -The Story of Mario Bauza. PBS documentary (1998). ^ Peñalosa, David (2010). The Clave Matrix; Afro-Cuban Rhythm: Its Principles and African Origins p. 26. Redway, CA: Bembe Inc. ISBN 1-886502-80-3. ^ Bobby Sanabria cited by Peñalosa (2009: 243). The Clave Matrix. ^ Neto, Luiz Costa Lima (2000). "The experimental music of Hermeto Paschoal e Grupo (1981-93): a musical system in the making". British Journal of Ethnomusicology: 119–142. Campos Fonseca, Susan. “¿Una habitación propia en el “Jazz Latino”?”. En: [email protected], Vol. 1, Nº2 (2010). Leymarie, Isabelle (1985). "Salsa and Latin jazz". In Quill (ed.). Hot Sauces: Latin and Caribbean Pop. New York. pp. 94–115. ISBN 0-688-02193-X. Leymarie, Isabelle (1997). "Du boogaloo à la salsa". In Gallimard (ed.). La musique sud-américaine: rythmes et danses d'un continent. Paris. pp. 82–85. ISBN 2-07-053391-3. Leymarie, Isabelle (1998). "La salsa". In Ediciones Akal (ed.). Músicas del Caribe. Madrid. pp. 107–108. ISBN 84-460-0894-7. Leymarie, Isabelle (1998). "Du tango à la salsa: le bal sous influence latino-américaine". In Cité de la Musique (ed.). Histoires de bal. Paris. pp. 115–122. ISBN 2-906460-69-9. Leymarie, Isabelle (2000). "La salsa". In Editions Autrement (ed.). Danses Latines. Paris. pp. 113–123. ISBN 2-7467-0118-9.